Below is a list of internet and book sources that were used in the creation of this website, including the individual pirate biographies, without whose hard work and research into the subject these pages would not have been possible. Attempts have been made to verify much of the information used on this site by comparing different sources. But with some of the information shown, a second source could not be found to confirm it's authenticity. 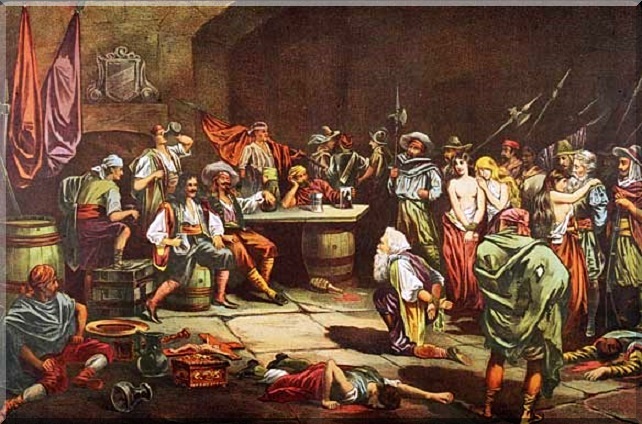 It is sometimes difficult to distinguish between truth and fiction when dealing with "Piracy of Old", as the personal accounts and events written about took place several hundred years ago. So many stories and tales have been told over the years that they begin to merge fantasy with reality. Therefore if you are using this website to help you write an historically factual account, you should keep this in mind and try to find other sources to check there accuracy. Most of the music and artwork used on this site was found by many long hours of searching the internet over the years for non-copyrighted material. Some is copyrighted and used by permission of the owner. Also some of the images presented within Brethren of the Coast were created exclusively for this website. I do not sell copies of the music or images used within. They are there strictly for site visitors to enjoy while browsing through it. 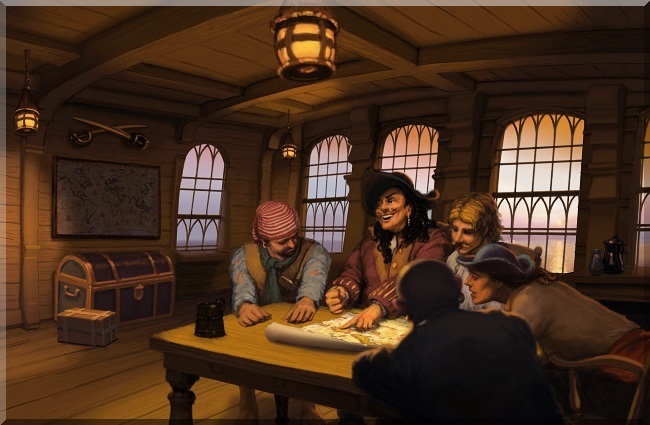 A special thanks to artist Chris Collingwood for allowing the use of an image of his wonderful Blackbeard painting within the main page banner of Brethren of the Coast. You can see more of this fine artists work at www.collingwoodhistoricart.com Credit here also for artist Andy Thomas who's work "And the Band Played On" can be found on my sea shanties page. The music on this website was designed to be heard with one of the following "up to date" internet browsers: Internet Explorer, Microsoft Edge, Firefox, Opera, Chrome, or Safari. Below is a list of known musical composers/performers who's entertaining work can be heard playing in the background on some of this sites pages. If you like what you hear, support these artists by purchasing their CD's or Tunes, and listen to more of their music. If I am using anyone's copyrighted material by mistake, or have failed to give someone the proper credit they deserve for their hard work, you can contact me through this email link kevin@brethrencoast.com Note: I am notoriously bad at regularly checking my emails, your patience would be greatly appreciated. No infringement of copyrights was intended here in the creation and publishing of this website. I shall remove any such material or give credit to the rightful owner at their request, providing they have reasonable proof of ownership. Thank you to all who have contributed their time and knowledge to this website over the years. To my visitors, I sincerely hope Brethren of the Coast will be helpful and enjoyable to those of you interested in the subject of piracy in the golden age. Lastly, a very special thank you to my lovely wife Lady Morningstar for her patience, understanding, and support of me in the creation and upkeep of this website. Most of the websites I've listed below have sadly died off over the years. They were good sources of knowledge and reference while making this site. reference sources in the making of Brethren of the Coast. Page best viewed with a 1024px width. Copyright 2000-2019 Brethren of the Coast, All Rights Reserved.